I got it! Having beaten Cornell’s David Jones, Harvard senior wideout Adam Scott awaits a touchdown toss from Tom Stewart. The 30-yard score put the Crimson ahead 14-7. I beg to differ, sir! Harvard junior linebacker Cameron Kline debates a fine point of pigskin etiquette with Cornell’s David D’Amelio. Harvard loses Justice Shelton-Mosley to injury. Harvard loses to Cornell 28-24. 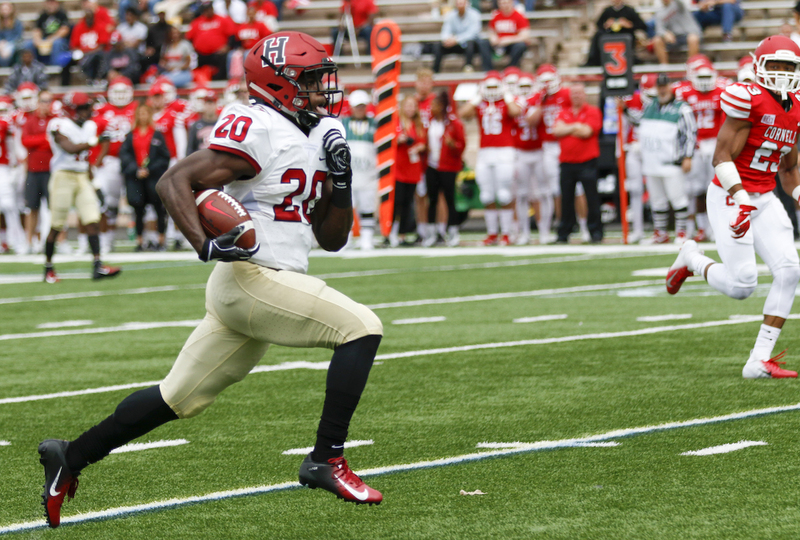 Those were the headlines to emerge from the Crimson’s game against the Big Red on Saturday at Schoellkopf Field in Ithaca, New York. The defeat drops Harvard to 2-2 overall and 1-1 in the Ivy League. (Cornell has the same record.) Grievous as the outcome was, it is relegated to below the fold beside the injury to the charismatic wideout and two-time All-America kick returner, who hurt his left leg in the first quarter when he was tackled after a 13-yard punt return. At this writing, Harvard coach Tim Murphy had not revealed the exact nature of the injury and how long the senior star might be out. On Saturday, one thing was sure: It was a crippling blow not only for Shelton-Mosley but also for the Harvard offense, which had to navigate without its most explosive player, the one for whom opposing defenses had to game-plan. As it played out, Saturday’s game bore an uncomfortably uncanny resemblance to the 2017 meeting between the two teams, also at Ithaca and also a come-from-behind victory for Cornell. The difference this time was that early in the fourth quarter Harvard appeared to have the game in hand—before it surrendered two late touchdowns. 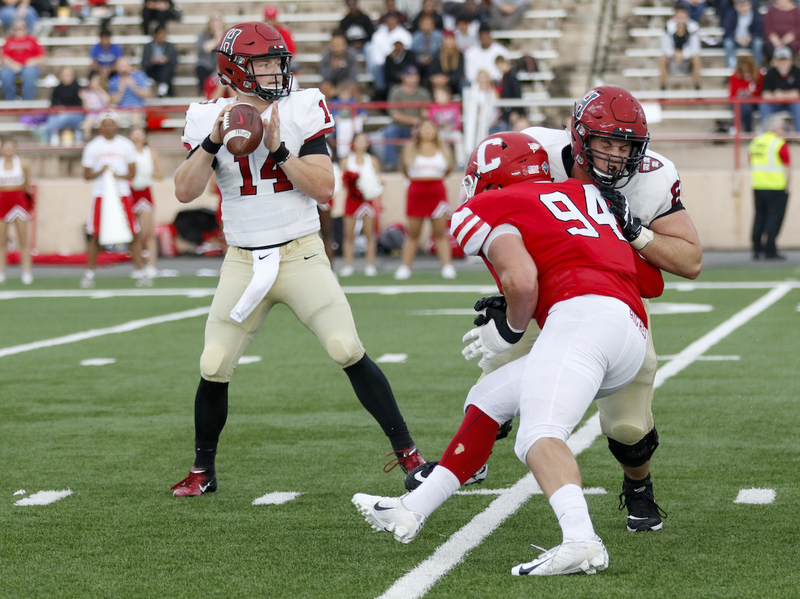 The Big Red comeback spoiled a decent effort by backup quarterback Tom Stewart, the senior who relieved sputtering sophomore starter Jake Smith in the second quarter. And it wasted an 11-tackle day by senior safety Cole Thompson, as well as another magnificent outing by sophomore running back Aaron Shampklin, who slipped, stutter-stepped, and streaked to a game- and career-high 191 yards on 27 carries. On the opening drive Smith, Shelton-Mosley and Shampklin were in in top gear. Smith connected with Shelton-Mosley on a 27-yard pass that brought the ball to midfield. Then, on third-and-seven from the Cornell 47, Smith handed the ball to Shampklin, who busted through a huge hole on the right side created by the offensive line, then accelerated and romped untouched all the way to the end zone. Junior Jake McIntyre booted the extra point. Two minutes into the game, it was Harvard 7, Cornell 0. Harvard’s defense came into the game leading the nation in rushing defense, allowing 50.0 yards per game. And on Cornell’s first series, it lived up to its billing, forcing a three-and-out. 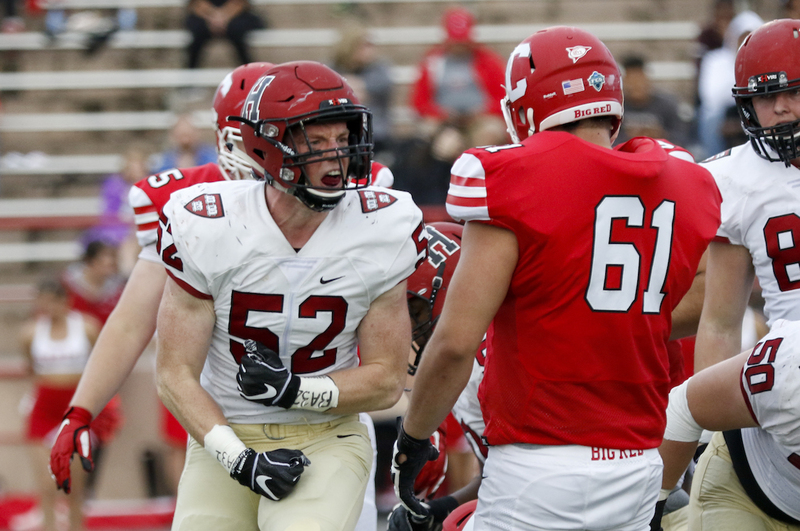 The Big Red’s Koby Kiefer then punted to Shelton-Mosley, who made a 13-yard return to the Crimson 43, where he was brought down by Cornell’s Nathaniel Weber and Malik Leary. Shelton-Mosley stayed down, clutching his knee. It didn’t look good. Helped off the field, he later would appear on the sideline wearing sweats and an air cast, and walking with the aid of crutches. Late in the second quarter another punt—by Harvard freshman Jon Sot—would prove injurious. Cornell’s Dylan Otolski broke through to block it, and the Big Red’s Justin Bedard scooped it up at the Harvard 15 and ran it in for a touchdown. (This was yet another special-teams bugaboo of the kind that has plagued the Crimson so far this season.) Kiefer kicked the conversion. Harvard 7, Cornell 7. Shortly thereafter Stewart replaced the harried Smith, who had gone only 3-of-11 passing for a paltry 37 yards and been sacked twice. It wasn’t all Smith’s fault; the Big Red defensive backs were blanketing his receivers. Early in the third quarter Stewart did supply a spark, taking the Crimson 78 yards, 29 of which he provided with his own legs on a run around right end. From the Cornell 30, he hit senior Adam Scott with a pass in the left corner of the end zone. McIntyre kicked the extra point. Harvard 14, Cornell 7. The lead lasted all of one minute and three seconds, and four plays. On the first, Dalton Banks, one of two Big Red quarterbacks, completed a 45-yard pass to Owen Peters. On the fourth play, the other quarterback, Mike Catanese, ran right up the middle for 32 yards and a touchdown. Zach Mays kicked the extra point. Harvard 14, Cornell 14. Shortly thereafter the Crimson appeared to take irrevocable control of the game. Late in the third quarter, Shampklin shimmied for 34 yards to the Cornell 39. Harvard eventually reached the Big Red 15 but on third-and-eight, Stewart took an ill-advised 10-yard sack that seemed to knock the Crimson out of field-goal range. 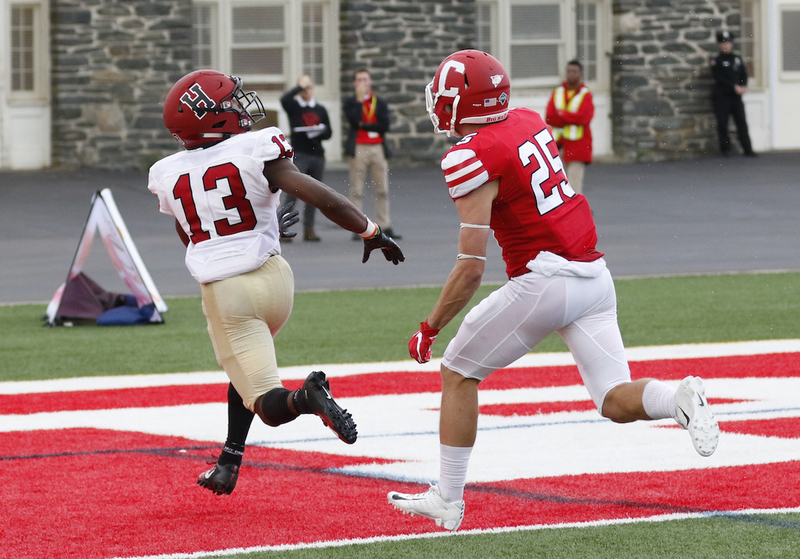 But McIntyre drilled a career-long 42-yarder that made the score Harvard 17, Cornell 14. Early in the fourth quarter, Stewart relied on the running of another sophomore back, B.J. Watson, to begin a 60-yard drive that ended with a 29-yard toss from Stewart to senior wideout Henry Taylor in the back left corner of end zone. McIntyre again booted the extra point. Harvard 24, Cornell 14. This was a galling defeat. Harvard held the ball eight-and-a-half minutes more than Cornell did and outgained the Big Red 425 yards to 356. But Cornell won the battle of crunch time—a part of the game Murphy teams have always taken pride in dominating. What’s left for Harvard is to regroup, maybe without its best player and with an unsettled quarterback situation. Looming is the meat of the Ivy schedule, which includes in back-to-back weeks Princeton and Dartmouth, which this weekend looked unstoppable and immovable respectively. I read the news today, oh boy. Head games: The Ivy League’s institution of new kickoff rules reduced concussions by 68 percent over the past two seasons, according to an article published last week in The Journal of the American Medical Association. The major changes involved moving the kickoff from the 35-yard line to the 40, promoting touchbacks and thus minimizing or eliminating collisions between the kicking and return teams. Now 50 percent of kickoffs result in touchbacks, compared to approximately 18 percent previously. The NCAA has taken this ball and run with it, establishing a new rule that permits kick returners to call for a fair catch anywhere inside their 25-yard line, with the offense putting the ball in play at the 25. Tidbits: Defensive lineman Alex White ’19, of Leverett House and Maiden, N.C., has been named a semifinalist for the William V. Campbell Trophy, awarded by the National Football Foundation. Candidates for the award must hold a GPA of at least 3.2 and must have shown outstanding football ability. White’s field of concentration is biomedical engineering. Last year, in 10 games, he had 25 tackles (including six for loss) and 4.5 sacks. Against Cornell on Saturday he was credited with two assisted tackles. Finalists for the Campbell Trophy will be announced on October 31 and the winner revealed on December 4….With six points against Cornell, junior Jake McIntyre moved into sixth place in Harvard history for points scored by kickers. McIntyre’s 126 points are 13 fewer than the total of Jim Villanueva ’84, who is in fifth place. Coming up: Next Friday Harvard returns to the Stadium for its final night and non-Ivy game of the season, against Holy Cross. Kickoff: 7 p.m. The game will be streamed on ESPN+ and broadcast on the radio on WRCA 1330 AM, 106.1 FM and 94.5 FM-HD2, and on WHRB FM 95.3. The Crusaders, of the Patriot League, are 1-5. The Crimson leads the overall series 42-25-2 but lost the most recent game between the schools, 27-17, in 2016.